When you're outside in the sun in the summer or swimming in a pool, you might notice that the color in your hair tends to fade or that the hair gets stringy. It's important to protect the hair from the harsh rays of the sun and the heat of the summer air so that there isn't any breakage or significant damage to your beautiful locks. There are a few tips that you can follow to keep your hair as healthy as possible. Try to cover the hair as much as possible when you're outside. Keeping a hat or a scarf on will help to keep the moisture in the hair, preventing the strands from drying out. 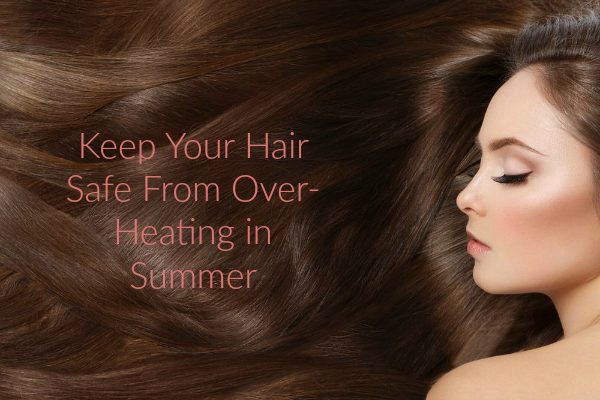 Wear the hair loose in the summer to keep sweat from building and to keep air circulating through the strands. Even though it's hotter in the summer and your hair might feel oily, avoid washing the hair every day. Washing the hair a lot in the summer will strip away the essential oils that are needed to fight against sweaty buildup, keeping the hair as moisturized as possible. When you do wash the hair, use a gentle shampoo and conditioner in one, such as the products in the WEN line of hair care. Unless you're going somewhere shortly after washing the hair, let the hair dry naturally. Don't use any more heat than is necessary. Combined with the heat from the sun, you're going to make the hair very dry, which can cause split ends and breakage. A deep conditioning treatment at least once a week is good for the hair in the summer. It helps to keep the frizz at bay and helps to lock in moisture. If you're looking for an easy way to prevent sun damage, run your fingers through your hair after applying sunscreen. Don't use a brush in the summer. Use a wide-toothed comb to go through the hair. It won't be as harsh on the strands and will detangle the hair faster than using a brush. Get the ends of the hair trimmed in the summer to keep split ends at bay. Drinking plenty of water can also keep hair healthy and shiny in the summer. WEN by Chaz Dean is a line of hair care products that includes cleansing conditioners. These conditioners, along with treatment oils, are made with natural ingredients. When used as directed, you won't need to wash your hair as often in the summer, keeping your locks healthy and happy throughout the season. Cleansing conditioners have the shampoo, conditioner and other products in one bottle so that you're not using a lot of different products for your beauty regimen. For more information, visit WEN by Chaz Dean on Facebook.